Photograph of the Dominion Bridge Company's Burnaby Plant. 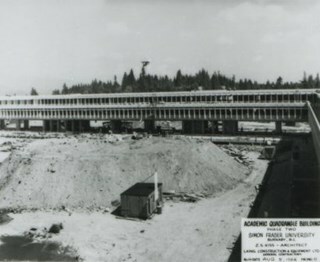 Photograph of a building under construction at the Simon Fraser University site. A label on the photograph reads in part: "Women's residence. Erickson-Massey Architects. Laing Construction and Equipment Ltd. General Contractors." 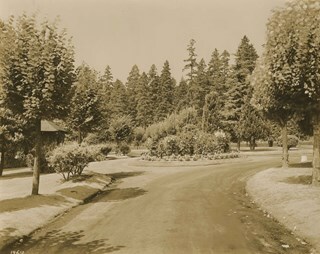 Photograph of the roundabout at Ocean View Burial Park. 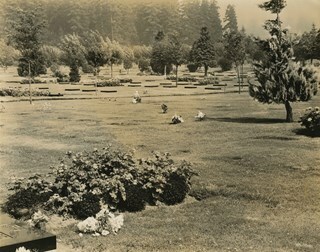 Photograph of a grave site and the surrounding cemetary land at Ocean View Burial Park.